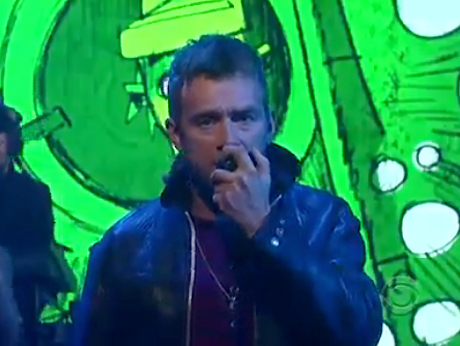 With that North American tour in full swing, Gorillaz are taking advantage of the trip by making the late night TV rounds. On Thursday (October 7), the group stopped by Late Show with David Letterman and dished out a rendition of "Rhinestone Eyes." Down below, you can check out the video for the Plastic Beach track to get you all pumped for their remaining Canadian dates, which find Gorillaz in Toronto on October 14 and Vancouver on November 3. Plus, because the Letterman folks are so generous, why don't you check out an entire 45-minute concert at the Ed Sullivan Theater (it's the second video below). De La Soul stop by.